I had a position a while back in PCN -- PIMCO Corporate Income Fund -- a bond fund. It appreciated 60% in a matter of weeks and I sold it. It dropped and it hasn't recovered since. Nonetheless, it still trades for a whopping 18% premium to NAV. Today, I took another look at it to see what's going on and whether or not it still is a good investment, despite the ugly premium. Its yield is certainly attractive: 14%. My first concern about it was whether or not it was eating into principal in order to support its high yield. Many closed-end funds do that. Of course, that's not a sustainable strategy nor is it profitable for the investor. So I took a look at its most recent quarterly report (note: I only trust the report on the SEC website). And as usual, I also went back to its previous quarterly report. I was flabbergasted by what I found out. Care to take a wild guess why? Search on both reports for "Fair Value Measurements". The fund recently adopted FAS 157 and switched the bulk of their portfolio fair value estimation to Level II. Level I determines that securities are valued on the basis of market prices (mark-to-market, if you will). Level II uses "other significant observable inputs" and Level III is pure witchery. Why would they adopt FAS 157? One reason is the market dried up for corporate bonds. However, is this really true? There are still bid and ask prices out there for almost all securities, certainly more than 0.97% of their portfolio, which is the amount they claimed they could use Level I quotes for, and 98.6% for Level II and the rest for Level III. My brokerage still shows me quotes for most of PCN's portfolio, including widely traded bonds such as those of GE, C, F, GS. Even worse is the fact that they report $33 million in Treasury Bonds which accounts for 5.5% of the portfolio. How can treasury bonds not be quoted at Level I? To be sure, using Level II doesn't mean the securities became more risky, it only means they became harder to value. And while I can believe that the current market environment doesn't make things easy, I strongly doubt using Level II for 98% of a corporate bond's portfolio is warranted, especially when there are such large positions in very liquid securities. I also checked IQC, a California Muni fund I currently own. They too adopted FAS 157 recently and switched the bulk of their portfolio to Level II. CIF, another popular corporate junk bond fund, has been on Level II for a few quarters now. Given that I don't understand why the radical switch nor why Level I quotes are impaired, I prefer to stay away from these funds for now. I will need to make a decision about my IQC position soon. The NYSE periodically lists the top 100 open short positions. This list is interesting because it shows which companies the market believes are overpriced. Sadly, the NYSE list only shows total shares sold short, not what percentage of shares outstanding these are. The handicap is obvious: it's hard to compare companies and to gauge just how much short interest there really is. One needs to look at the short interest as a percentage of the shares outstanding. Another interesting metric is to look at the days-to-cover number. As it says, this number indicates how many days it would take for short sellers to unwind their positions. This number is interesting both as a short seller perspective and as a contrarian one. It shows how willing short sellers are to short the stock given the danger of a long and painful short squeeze. Perhaps the product of both numbers is even more interesting to look at since it combines both equally. A word of caution though is to be careful when shorting low-priced stocks, since they tend to be more volatile and show larger swings, forcing a short seller into margin calls and big losses. Without further ado, here's the list, with the extra fields mentioned above added. In modern finance theory, there is no difference between valuing a dividend-payer stock versus a non-dividend payer. In theory, both kinds of stocks will be worth the sum of their future free cash flow, discounted at an appropriate rate. In the figure below, we represent a money flow from a company's earnings to you, directly into your pocket. Assume the company earns $15 per unit of time, say per quarter. Upon earning money, the company declares a dividend of $10 (a 67% payout ratio). At time zero, let's say you have zero dollars and the company has $30. It then decides to pay $10 dividend. After paying the first dividend the company now has $20 and you have $10. Then, the company earns another $15 and pays you $10. You now have $20, and the company has $25. And so on. At the end of 5 quarters, you've accumulated $50. For simplicity, let's say that the company ceased to operate and the cash remaining in its coffers went to pay debt. You would get nothing else at liquidation, but you kept your $50. How would you value this company at time zero? Well, I would sum up all the cash flows to me and discount it at some rate. For simplicity, let's say the discount rate is zero. So the total worth of this stock to me is exactly $50, since that's what I will get out of it. Now, assume the same company didn't pay you a dividend, but instead kept it in its savings account. The figure below illustrates the cash flow, just this time you get nothing all along, until the company liquidates, pays you the same 67% payout , in excess of what it owes, and uses the rest to pay the creditors. You would get your same $50 and the company would keep $55, which it would use to pay creditors. So the valuation of this company must be the same as the one before: $50 (again, ignoring the discount rate). So, in theory, the value of a company is independent of whether or not it pays a dividend. Some would even argue that dividend payers should be valued even a little lower, since you as a shareholder have to pay taxes on the dividends you get, while the company gets to keep it tax free (well, not quite tax free, it pays corporate taxes, but you as the shareholder get to keep more money in the company's coffers if it doesn't pay a dividend, due to the double-taxation system). But what's the problem with this reasoning? There are many. The most important one is that unless you know and trust management, how can you be sure you will eventually get money out of a company? You don't. In many cases, management sees a pile of money and decides to expand their empire and buy other companies -- at usually very unreasonable prices. Other examples of malinvestments abound, such as throwing money at losing product lines, paying out huge bonuses to themselves, blatant theft (see Financial Statement Analysis for how to spot "cooking" of books by crook managers). Cash, inventory, patents, equipment and market share can all go away quickly. A company's attractiveness can vanish due to poor management or adverse economic times. Having a history of dividends can help an investor put a value on a stock and get paid while he holds his investment. On the other hand, paying out a dividend when the company can't afford it is a bad idea and one should avoid buying companies that need to borrow to sustain their dividends. Moreover, the dividend can be cut and vanish just as quickly as the company can be mismanaged, so be careful not to over-emphasize dividends in your evaluation. As we've seen, the potential to pay a dividend in the future is almost as valuable as having one now, as long as your confidence in the company not destroying what it has built is very high. In conclusion, dividends provide an interim return, which I see as the price I should be paid to invest in a company. Whenever two securities are roughly equally attractive to me, the one with the dividend will always win. However, limiting oneself to only dividend payers is a mistake. One should invest in sound companies with sound management and with decent prospects of earning money. I just came across this snippet below, from Saj Karsan's excellent summary of the famous Security Analysis book, by Graham & Dodd. Apparently banks didn't learn the lessons from the 20's. I wasn't aware of these things either -- if only I had read this book more carefully when I first read it, a few years ago. All this sounds exactly what happened recently. Last year, an ex-Lehman mortgage trader I know, talked about how investment banks had to lower their standards or lose business to more aggressive banks. The result we all know: rule number 1) above was violated and when RE prices declined (even though they never decline! ), things went haywire. Many loan guarantors (AIG included) weren't well-diversified enough, violating rule 2). All hail Ben Graham, the new Nostradamus. Estimating the fair value of a stock is an exercise in predicting the future. Estimating the fair value of an entire index, such as the S&P 500 is not any easier. Luckily for us, it doesn't involve estimating the future of 500 companies simultaneously. We can treat the entire index as a single company (sort of like a conglomerate, with multiple divisions). Many people like to predict future earnings and then apply a multiple (such as the P/E multiple) or forecast free cash flow year over year, apply a discount rate and add up the values. Others, like me, prefer to value a stock using the stream of dividends it will provide in the future, using the Dividend Discount Model (DDM). A dividend growth rate inline with smoothed historical rates. So, what is a good historical dividend growth rate? Let's look at the past to estimate that. The raw data can be found here. Since 1960, the dividend rate has grown on average at 5.68% over the years. The discount rate has varied a lot as investors took more or less risk depending on their perception at the time of risk, inflation and future growth. Fitting the DDM over the years to get a good approximation yields a 7.5% rate of discount (see the figure). This is the return rate an investor should demand for exposing his money to market risk. 7.5% seems appropriate as a long-term rate, even if it seems low right now, since times won't always be bad in the future, nor will they necessarily be good, like they were in the late 90's, when investors were demanding very little rates of return (even negative!). Now, all we need is a starting point for the dividend the S&P500 index will pay an investor this year. Well, let's make an educated guess. In 2008, the dividend was $28. Since then, many companies have cut their dividends, suspended them or gone bankrupt. Very few have raised their dividends. 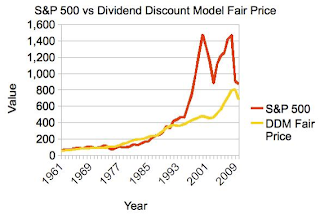 If we assume a 15% drop in dividends for 2009, the fair value of the S&P 500 should be 681, not the current 870. See the figure above for a plot of the estimated fair value versus the real value since 1960 (2009 numbers are measured year-to-date and estimated are year-end). Can it fall more? Of course. Can it go up more from here? Sure. The best bet is to buy companies that are undervalued based on the Dividend Discount Model and for which future prospects look solid. As for the S&P 500, I wouldn't bet on a continued rally from here.